Household garbage is collected weekly in all areas. Recycling is collected fortnightly in all areas. 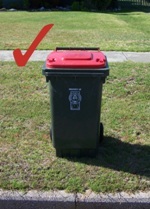 The bins must be placed at the kerbside prior to 6am on the day of collection (see your calendar), or the night before. 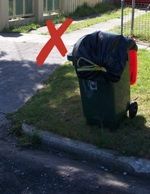 Pickup will occur between 6am and 5pm, and bins should be returned to your property as soon as practical after collection, to avoid vandalism or theft. Recycling is collected on the same day as your garbage collection. Beechford, Lefroy, Mt Direction, Pipers River and Pipers Brook. Side-loader trucks with mechanical arms require your bin to be placed clear of obstructions in a suitable location. 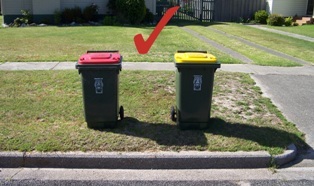 This includes placing your wheelie bin no closer to your recycle bin than 1m, and ensuring that your bin is not over full. The wheels of the bin must be facing away from the kerb and it must be on level ground. In some small cul-de-sacs, it may be necessary to place the bins together at the entrance to the cul-de-sac where the road is usually a bit straighter, as the mechanical arm may not be able to reach bins placed on the curved parts of the kerb. Issue of New Waste Containers (PDF). Please note: Personal signature is required before submission. Waste Management Frequently Asked Questions (FAQS).